A transformational experience that will enhance your unique value and enable you to play a leading role in shaping the world. IE University is for students who approach learning as a way of life, and who are open to the world and to the transformative role of higher education. We provide a supportive community where students and faculty interact together in the learning process. The unique learning environment at IE University is built upon the bringing together of a personalized, student-centric community, within an open environment that embraces a rich diversity of individuals, ideas, and approaches. 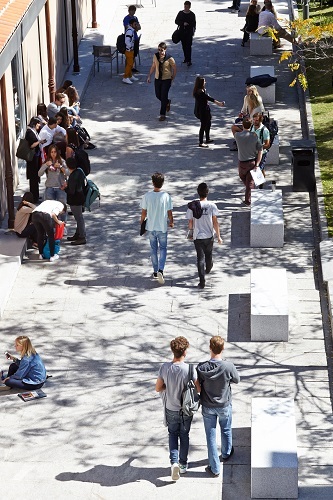 Each year over 100 nationalities are represented on its campuses in Segovia and Madrid, with over 65% of its students coming from outside of Spain. IE University is recognized for its quality in teaching and learning which counts it among the world’s top universities. In addition, its undergraduate programs are recognized by the most prestigious associations in their respective fields. With a humanistic approach, entrepreneurial spirit, innovative vision, and focus on academic rigor, IE University is committed to educating professionals and experts who will make a difference in society. Our practice-based approach to learning starts in the classroom and continues in different parts of the world to fully prepare IE University students to become international professionals. If you want an inspiring and challenging education that will shape who you are and who you will become, IE University will broaden your horizons, connect you to the world, and guide you on the unique path needed to achieve your goals. IE University offers a unique learning environment that is redefining higher education for professionals today. We will prepare you for success by enabling you to develop your own point of view and discover your full potential. IE University is recognized for its quality in teaching and learning which counts it among the world’s top universities. IE University takes a personalized and student-centered approach to education where professors and students are actively engaged in the learning experience. You will join a supportive community which values your uniqueness and will guide you as you shape your own path. The IE University’s diverse faculty is comprised of both excellent academics and experienced professionals with international experience and close ties to the business world. What is more, our professors are accessible to you. You will have daily interaction with your professors, who support you with regular feedback and connect you to the professional world. We provide an environment where you can be open to new ways of thinking, release your creativity, and venture into the unexplored. Our innovative degree programs are recognized by the most prestigious associations in their respective field and integrate a variety of teaching approaches and options that allow you to shape your own education according to your professional aspirations. We combine theory with practice from the moment you start your studies. You will take what you learn in class and apply it to real life cases and when managing your own projects. Each year students can choose a range of internship options, working on campus, in Spain and around the globe, and acquire an impressive set of skills and professional experiences that make them highly sought after when they graduate. You will join a vibrant and diverse student community who live their university life to the full. Enjoy living in Spain, traveling, and participating in all the extracurricular opportunities you will have at iE University. We help our graduates launch their careers across industries and around the globe. Employers of leading companies worldwide consider IE University among the top universities where they want to recruit from. What’s more, you will belong to a community of more than 45,000 IE alumni worldwide, make friends for life, and enjoy an active alumni network that you can always depend upon throughout your professional journey. Our degree programs are recognized by the most prestigious associations in their respective fields and offer a variety of teaching approaches and tools that are adapted to your professional interests and aspirations.